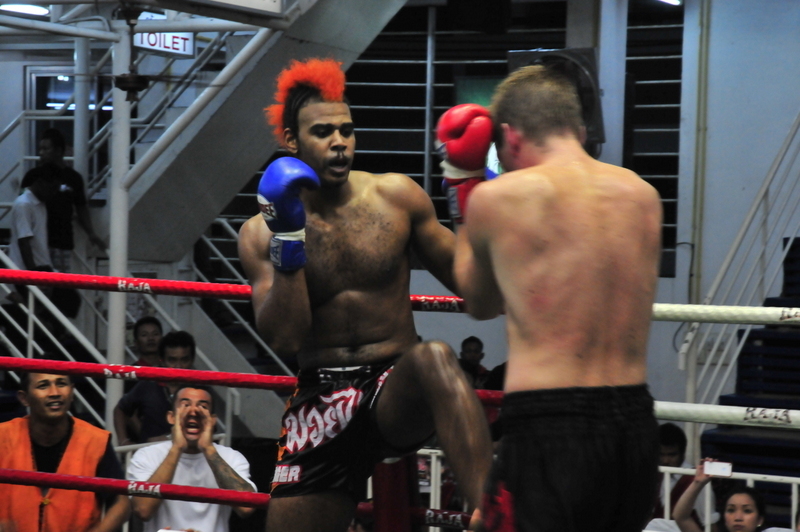 With three fights on the card last night (May 13th) at Bangla Boxing Stadium, Tiger Muay Thai & MMA Training Camp Phuket, Thailand exhibited the skills and training of seasoned veterans but came up just short on two occasions as one bout turned out to be one of the best Muay Thai fights in months. American born fighters Derek Formoso and Trevor Hicks, along with Tiger Muay Thai trainer Seuadao, brought crowds to their feet on several occasions. 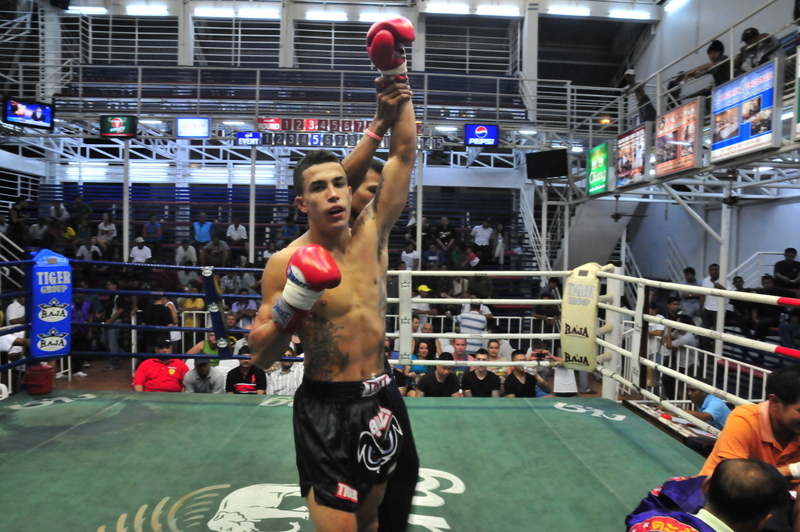 Though Formoso was the only winner of the night, Seudao’s clear “Fight of the Night” bout ended in a contentious decision. Formoso (4-1), a native of Sacramento, California, started the fight in his usual aggressive style, doling out kicking combinations that landed a few times. He sent his opponent to the mat with a leg sweep in the first round, after taking some hard elbows early in the round. In the second round, Formoso was on form giving his opponent jab to the face, followed by a jumping knee to the head, and a quick barrage of punches that ended with a clean kick to the head. Still, his opponent created opportunities to counter Formoso with several elbows. (see the fight here). Trevor Hicks, of Tucson, Arizona, showed just as much aggression though it resulted in a different outcome by the third round. The 25-year-old former college football player attempted to outbox his opponent, Norwegian-native Erik, using his reach advantage. Erik, who was recently featured on an episode of “Norway’s Best Fighter,” showed his kicking ability and gave Hicks a tough go in the first round, despite the American landing some big time jab and right hook combinations. Erik picked his moments and eventually took Hicks down in the third round with several kicks to the midsection after working in some devastating knees throughout the fight. The night’s main event featured a bout between trainers of Dragon Muay Thai and Tiger Muay Thai – a fight that could have easily gone either way. Pradub “Seuadao” Ruangram went an aggressive five rounds with Petzilla of Dragon. The two veterans trading heavy kicks throughout.